Collaborative - so you can coordinate and plan as a team. Comprehensive - model anything, analyze everything. Continuous - ongoing forecasts, adapts quickly to change. Active planning requires a planning tool that’s easy, powerful, and fast. Without all three factors, you’ll end up with a static plan. Other planning solutions force compromise, offering only one or two of these qualities but not all three. Break Free from the Spreadsheet Model! Empower finance teams and managers with intuitive and interactive self-service reporting and financial analysis. Distribute board reports, slice and dice management and financial reports, and drill down into the details with speed and ease. 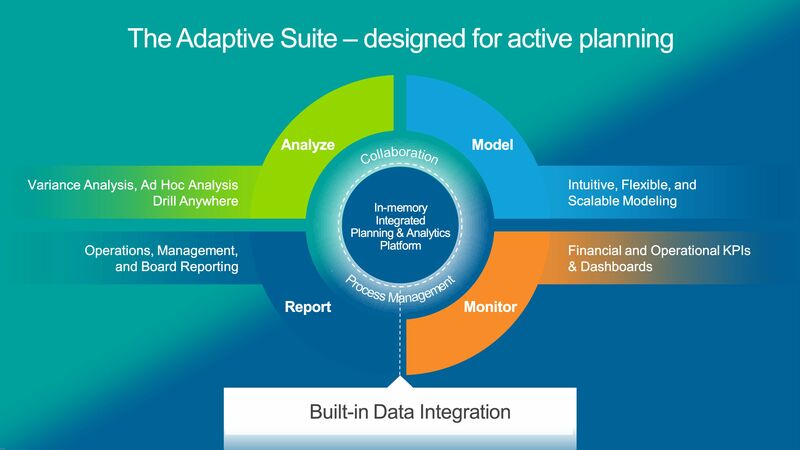 The Adaptive Technology Foundation powers the Adaptive Suite. At its heart is an in-memory planning and analysis engine that enables instantaneous calculations. Workflow and business process tracking allows teams to collaborate in real time. And our Adaptive Integration framework provides always-connected integration with your ERP, CRM, and HCM systems. We help you take full advantage of Adaptive Insight's powerful features. Our expert team of certified Adaptive Insights business and technical consultants are your trusted advisors equipped to offer higher level strategic advice designed to continuously maximize and enhance your use of the Adaptive product. By taking an in-depth look at your current process, we determine the most efficient ways for you to leverage the Adaptive tool. This includes implementing best practices in planning methodologies, industry planning standards, rolling forecasting, variance analysis, beyond budgeting and more. Closely related to process consulting is the review and analysis of your model. Our experts will guide you out of pitfalls such as the continued use of the spreadsheet model and into implementing efficiencies and revised processes to simplify and streamline your model. We get you from where you’re at today, to where you want to be. Included with our services is our Continued Support team. Have changes occurred in your business or have new people joined your organization? Intimately familiar with your process and your model, we continue to stay involved and are your trusted advisors to keep you on course through continued support and training. and break free from the spreadsheet model.